Chinese handset maker Oppo has expanded its A series with the launch of Oppo A7n smartphone in its home country. The budget smartphone is powered by MediaTek’s 12nm Helio P35 SoC and features a 16MP selfie camera. The Oppo A7n is priced in China at 1499 Yuan which is roughly Rs. 15,344 for the lone 4GB RAM + 64GB internal storage variant. It comes in single Lake Light Green colour option. The availability details of the phone are still unknown. 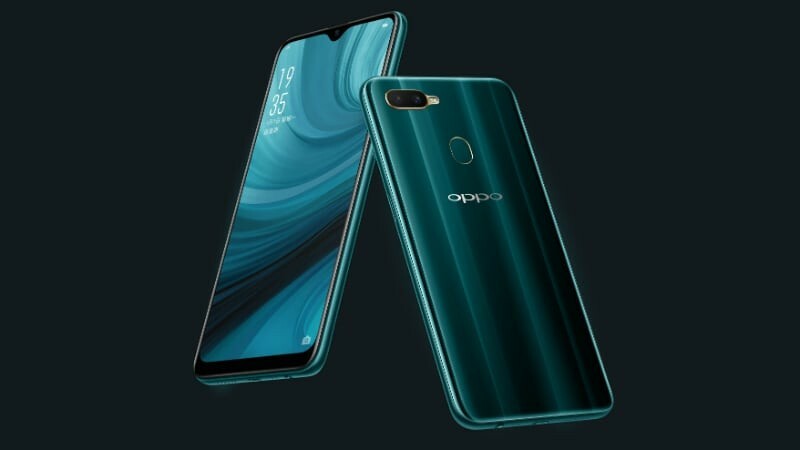 The Oppo A7n bears a 6.2-inch In-cell display with HD+ screen resolution of 720 x 1520 pixels, 270ppi of pixel density and a 19:9 aspect ratio resulting into a screen-to-body ratio of 88.3%. The display comes with a trendy waterdrop notch at the top which houses the selfie camera and helps to increase the screen-to-body ratio. Under the hood, the device is powered by MediaTek’s 12nm Helio P35 octa-core processor along with IMG GE8320 GPU, 4GB of RAM and 64GB of inbuilt storage. The storage can be expanded up to 256GB via microSD card. The phone also gets a Hyper Boost acceleration engine that is touted to enhance the performance and gaming experience. For security purpose, the phone features a rear mounted fingerprint sensor. It runs an older Android 8.1 Oreo-based ColorOS 5.2.1 OS out of the box. There’s a 4,230mAh battery underneath to keep things ticking. In the camera department you get a dual rear camera setup which consists of a combination of a 13-megapixel f/2.2 primary sensor + a 2-megapixel f/2.4 depth sensor. For selfies, there’s a 16-megapixel f/2.0 AI camera on the front. The camera set up is backed by artificial intelligence (AI) and comes with a beautification feature that is touted to recognise 296 facial points to uplift selfies. Connectivity options included in the device are 4G LTE support, Wi-Fi, Bluetooth 4.2, and 3.5mm audio jack. In terms of dimensions, the phone measures 155.9×75.4×8.2 mm. There’s no word yet on the availability of the Oppo A7n outside of China. Keep watching this space for further updates.